The Wisconsin Humane Society’s Young Advocates Club is a group of committed young people, ages 13 - 18, who want to make a difference in the lives of animals. The purpose of the club is to empower young people to work together to help animals in need. Young Advocates work on various projects to share information in the community, raise funds to support our mission, and more! Meetings will be held after school from 4:00 to 5:30 p.m. on the second Tuesday of each month from January through June at the WHS Ozaukee Campus in Saukville. You can make a difference! Submit your application now. 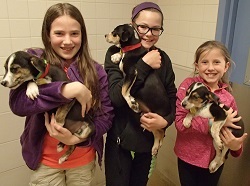 Click to download the Ozaukee Campus Young Advocates application and send it back to 630 W. Dekora Street, Saukville, WI 53080, Attn: Young Advocates Club, or aswanson@wihumane.org. Once we have reviewed your application, we will contact you. It’s that easy! If you have questions about the Young Advocates Club, please call Andrea Swanson at 262-988-5947. Can’t make the Young Advocates Club, but still want to make a difference?